Albatrosses have long been held in awe by mariners, who call them masters of the oceans. These birds seem to glide effortlessly into the teeth of a gale, over heaving seas. They come ashore only to be reunited with their mate and lay their egg. Albatrosses can be seen in the oceans of the southern hemisphere, and in the northern Pacific Ocean. There are about 22 species of albatross, and they all have in common webbed feet for swimming, long and narrow wings for gliding, a hooked beak to tear up food, and thick feathers for warmth. Most adults have a white body with dark upper wings and tail. The smaller albatrosses, also called mollymawks, have black across the back. A few species have mainly sooty or dark-brown plumage. Albatrosses are the largest of all the seabirds. The biggest is the southern royal albatross. Males weigh 10.3 kilograms, and have a wing span of up to 3.45 metres. The smallest is the yellow-nosed albatross, weighing 2.1 kilograms and with a wing span of 1.9 metres. Albatrosses spend most of their time in flight or sitting on the water. They travel thousands of kilometres over the ocean in search of food. Albatrosses mostly eat squid, but they also prey on crustaceans such as krill, and fish. Groups of birds can often be seen scavenging around fishing boats. Albatrosses come ashore only to lay their egg and raise their chick. Most breed in colonies on remote islands, far from predators such as rats or cats. Most build sturdy nests that are used for many seasons, and pairs often remain together for many years. They lay an egg once every year or two years (depending on the species), and the parents take turns incubating it and caring for the chick, and flying off to find and bring back food. The wandering and royal albatrosses are among the great albatrosses. The southern and northern royal albatrosses breed only in New Zealand. When not breeding they spend much of the time off the coasts of South America. Two forms of wandering albatross – Antipodean and Auckland wandering (or Gibson’s) albatrosses – are also unique to New Zealand. Mollymawks are smaller than the great albatrosses. 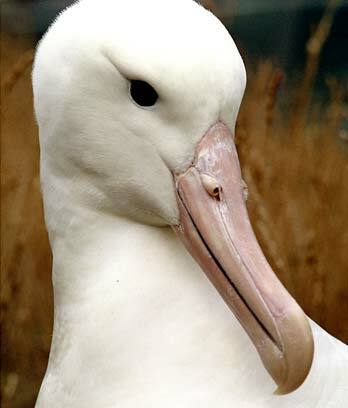 They nearly all breed in the New Zealand region – yellow-nosed albatrosses are the exception.